BBA or BBM ? Which one to Choose? SEE is no more an iron gate in our education. +2 has arguably replaced SEE from that coveted title. These days, +2 is considered as a much tougher and much more important stage in education, especially because your career is decided from what you choose after +2. If you are someone who aspires to become a manager, it’s a clear decision for you. You will want to study management in your bachelor degree and specialize in one of the management function in your master degree. But with emergence of two equally attractive management degree in the form of BBA and BBM, it’s tough to decide which one to choose. So, here we have come to help you decide the one that is right for you. In Nepal, colleges offer 21 different types of BBA program with affiliation from various National and International Universities. Tribhuvan University is the oldest, most renowned, internationally recognized and highest ranked university in Nepal. Apart from Tribhuvan University, BBA program is offered by almost all National Universities such as Kathmandu University, Pokhara University, Purbanchal University, Mid Western University etc. BBM program was launched by Tribhuvan University, only few years back. Apart from Tribhuvan University, BBM program of Asia Pacific University of Technology & Innovation is also being offered in Nepal. 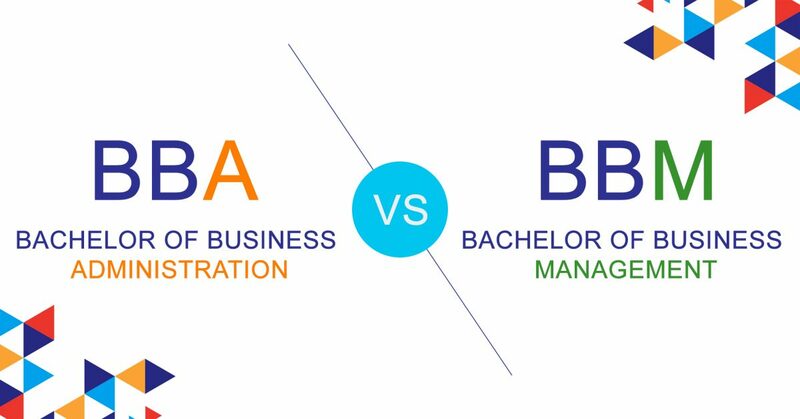 BBA refers to ‘Bachelor of Business Administration ’ and BBM refers to ‘Bachelor of Business Management’.Tribhuvan University has promoted BBA as more of an administrative management study with the curriculum focusing on all functions of management (e.g. Finance, Accounting, HR, Marketing, Operation etc.). Similarly, the university has promoted BBM as more of a managerial degree with the curriculum focusing more on financial management (Finance and Accounting) with equal emphasis on other management functions like BBA. So, technically, the curriculum has very little difference between these two programs. However, there is some significant difference in the career focus of these two programs. On one hand, BBA aims to develop operational and administrative skills in students while on the other hand, BBM focuses on developing managerial skills in students to prepare them for managerial roles. Entrepreneurship is something that both degrees offer enabling students to build their own business idea and start their own venture. “What is the difference between BBM and BBA”, asked a student. I said, “the difference is that of between your left hand and right. They look similar, work similar but have some different functions. 1. focuses on personal and professional skills development that includes your communication, interpersonal, time-management, stress-management, negotiation, team-building, and diplomatic skills. These are the skills that will come most handy when you start your job. 2. engages you in different co-curricular activities and projects. They give you in-hand experience of how work is done, and also increases your creativity by many folds. This also develops leadership skills in you. 3. associates you with different national and international institutions. This broadens your thought process and expands your vision to see further. This also develops analytical thinking ability in you. 4. emphasizes on developing your entrepreneurial skills engaging you in business plan development. This also includes encouraging you to participate in internal and national level competitions. This helps in standing out in the crowd. 5. encourages you and inspires you in your studies and in your co-curricular activities. 6. has strong network with alumni and with industries. This helps you get internship and job offer easily, and also help you build your own networks even during your studies. 7. and last but not the least, focuses on your education by providing you excellent faculty members who help you understand the core of the courses. To be honest, both degrees are equally good. Whether you study BBA or go for BBM, your future is equally bright. But studying BBA and BBM are not limited to their curriculum, but expands to numerous activities. Being a management graduate means you have developed all required skills and capabilities and gained essential knowledge for managerial roles after you graduate. So, be wise and select the right college for your BBA or BBM program.